Are you looking to spruce up your flooring? Heard good things about epoxy flooring, but don’t know as much about it as classic tile or hardwood? Choosing the right flooring takes many factors into account, from durability to cost and more. Let’s dive into a comparison of a few popular options: tile, hardwood and epoxy coating. 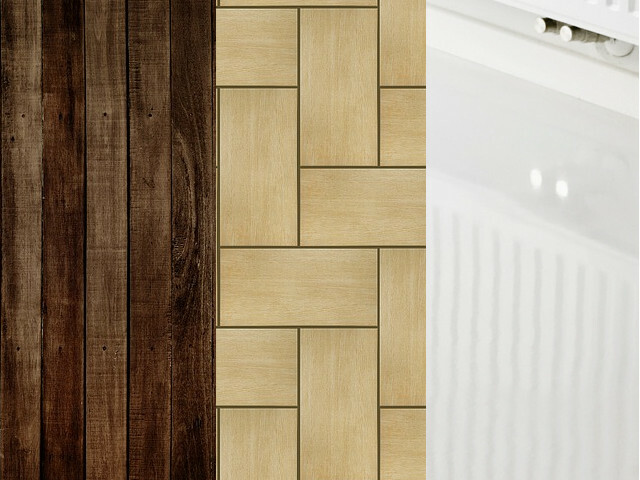 Tile is a great option for kitchens and bathrooms. It’s waterproof, scratch-resistant and quite easy to clean. That being said, there are downsides to tile you should know. Tile can break or crack if you drop anything heavy, so you have to be careful handling heavy pots in the kitchen. Additionally, although it’s easy to clean up spills from tile, the grout between tiles gets dirty quick – and the darkened colour can be a hassle to get out. Regardless, if you can maintain the upkeep and avoid dropping anything heavy, tile flooring has a very long life. Hardwood is a classic choice that brings a sleek or elegant look to a room, making it a good choice for living rooms and offices. It can last for decades and be made to look like new if kept in good shape as the years go on. The issue with hardwood is it is easily scratched and damaged by water. Hardwood may look smooth at first, but any dings become eyesores quick. If you’re looking for flooring in a low-traffic area, hardwood may be a great choice. Epoxy flooring is an excellent option for sleek, durable, cost-effective floors. Unlike other flooring options, epoxy floors are water-resistant, easy to clean, and not easily chipped or cracked. It is great for garages, as it can support heavy loads like cars or machinery. Epoxy coating is also non-toxic and doesn’t need harsh chemicals to clean. According to Blue and Green Tomorrow, the per-square-foot cost of epoxy floors is tough to beat. If you’re looking at a lower-budget option, this would be a great option for you. Not sure where you can put it in your home? Epoxy is most often used to give basement and garage floors a polished, durable finish. However, more and more designers are using epoxy coating in other rooms as well. So, what’s the best overall option? It all depends on the style you are going for when choosing your flooring – but if you want a sleek, simple design, epoxy flooring is the best overall option. Unlike hardwood, epoxy flooring is water-resistant, which works well for kitchens and bathrooms. And unlike tile flooring, epoxy flooring isn’t quick to crack or break when heavy objects are dropped on it. In terms of affordability, epoxy flooring is the most cost-effective option, especially since installation requiring no cutting or special tools or equipment. Your maintenance costs or time associated with any upkeep will be slim to none, as epoxy flooring doesn’t have any grout or gaps where dust can pool or cracks can form. Wondering how epoxy flooring can work for you and your space? Contact The City Painters for a free quote and details!